With the release of Jay-Z's album, "Magna Carta Holy Grail", ticket sales for his upcoming concert tour with Justin Timberlake have seen a huge spike. Epic Nation Tickets is offering cheap Jay-Z tickets to all shows starting this week. Epic Nation Tickets is offering cheap Jay-Z tickets to all shows starting this week. It has been one week after the release of the highly anticipated album, “Magna Carta Holy Grail”, by Jay-Z and that has spurned a huge increase in sale of Jay-Z and Justin Timberlake concert tickets. The upcoming "Legends of the Summer Tour" is just 1 day away from taking off in Toronto at the Rogers Centre. Epic Nation Tickets is your home to discount Jay-Z tickets for every concert stop along the "Legend of the Summers Tour". "Magna Carta Holy Grail" was released to Samsung users on July 4th via a digital download. By the time it was released in the United States on July 9th, the album had already gone Platinum, selling over one million copies thus far. The release of this CD just further helped interest in the upcoming concert tour featuring both Justin Timberlake and Jay-Z. Timberlake appears on a couple of the tracks on the concert as well, so expect to hear those tunes live. Justin Timberlake tickets will now be difficult to buy for almost every venue along this tour, so fans are encouraged to purchase tickets now at Epic Nation Tickets before the shows are a complete sell out. After traveling to Toronto, Jay-Z and Justin Timberlake will play two straight shows this weekend at Yankee Stadium. Jay-Z concert tickets for Yankee Stadium will go down as the hottest ticket on the tour according to most people. The thought of seeing Jay-Z and Justin Timberlake live in New York City will be something many people will find hard to pass up. Jay-Z and Timberlake tickets are also available for shows in Boston, Detroit, Miami, Pasadena, Baltimore, Philadelphia and more. 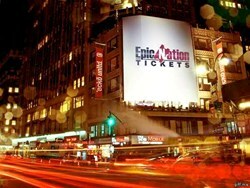 Epic Nation Tickets is the best source for tickets to all sports, concerts, Broadway shows and Las Vegas acts. All ticket transactions are 125% guaranteed and come with impeccable customer service. Those wanting to see Jay-Z and Justin Timberlake live may also want to purchase premium Beyonce concert tickets.